Synopsis: "I am King Tut’s wife, but my name is barely a whisper in history’s memory. I was the last of my family to survive the Aten revolution. I had a child at age 12 and was forced to marry three times. But that didn’t mean my story ended badly. My name is Ankhesenamun, my loved ones called me An, and I will stop at nothing to save my family." With a twist of biblical history interlaced, Ankhesenamun’s voice has a new song to sing which has otherwise been forgotten. Her story weaves through the sands of time as in each chapter, she narrates her past and the path her life has been directed to take. Between chapters, Ankhesenamun is dealing with the repercussions of her husband’s death as power-hungry men are grappling for pharaoh’s crown. My Review: Ankhesenamun is the third daughter of Akhenaten and Nefertiti. Her early life was happy until her father becomes obsessed with giving birth to a healthy son. She watches in horror as her father commits atrocious crimes for his god, Aten. Once Tutankhamun becomes king, it seems that her nightmare is over and a peaceful era has begun. She marries Tutankhamun and becomes his queen. However, Ankhesenamun realizes that peace is merely an illusion because behind Tutankhamun are power-hungry men that wait for the opportunity to seize his throne. Ankhesenamun must fight to protect her family from the men whose biggest wish is to see them dead. Ankhesenamun is a sympathetic character. She is truly a survivor. She experiences many horrors. She is the last of her line and is forced to watch her family die in front of her. My heart ached for her everytime she lost a member of her family. She is also forced to marry her father and gives him a healthy baby girl. After the death of Tutankhamun, she has to marry her grandfather, Ay. She tries to get out of the marriage by pleading to the Hittite king to help her. It ends up being a futile attempt to get out of her marriage to Ay. However the novel shows that these tragedies helped make Ankhesenamun a strong woman. I admire that she is really not afraid to stand up and fight for those she loves. She has a few flaws in this novel. She could be occasionally selfish and ruthless. However, Ankhesenamun is mostly a mature character in the novel. Because of the tragedies in her life, she is forced to become an adult at the age of nine. I could not stop reading this book because I hoped that she would eventually find some happiness in her life. Overall, this novel is about hope, faith, love, and family. The message of The Forgotten: Aten's Last Queen is that there is always a silver lining. Even though Ankhesenamun has many dark moments in her life, she learned that these moments paved the road to her happiness. I thought that most of the characters were developed. My second favorite character was Nefertiti. She seemed like a warrior queen. She even took up the sword to protect her family and her country. Tutankhamun seemed like a lonely boy that tried to be a great king to his kingdom. The only character I thought needed more development was the villian. His motive for wanting to destroy Ankhesenamun’s family was very silly. I like how the author incorporated the story of Moses in the Bible and that it played an important part in the story. The aspects I did not like in the novel was the unnecessary love triangle and the story switches periodically between Ankhesenamun’s life as King Tut’s widow and Ankhesenamun’s past. These time jumps made the reading a bit confusing for me and harder to keep track of the story. 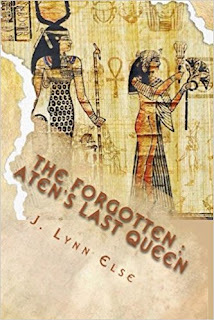 Still, The Forgotten: Aten's Last Queen is a feast for historical fiction lovers and features a captivating heroine. It is meticulously researched and is an engrossing novel. I recommend this novel for fans of Michelle Moran, Pauline Gedge, and Stephanie Thornton.